UK Shelf Sea Biogeochemistry Blog: Studying radium concentrations in the muddy sendiments off the north west coast of Cornwall. Studying radium concentrations in the muddy sendiments off the north west coast of Cornwall. On Tuesday we continued with our coring as well as performing a few more CTDs. 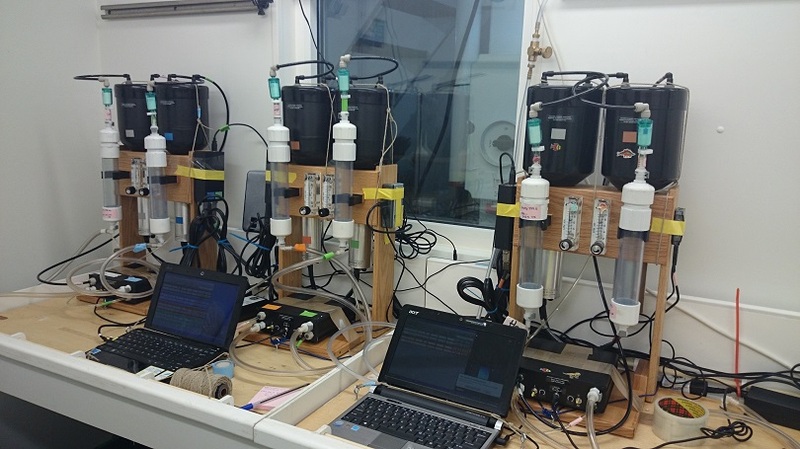 Amber Annett (Edinburgh University) is taking water column samples from the CTD and sediment samples from an instrument called a megacorer, in order to study radium concentrations in the sediment and the overlying water, and she has written the following blog piece about her work. Naturally occurring radium is a very useful element for studying many different shelf sea processes. This is because it is radioactive (no, not that dangerous sort of radioactive! ), and we know the rate at which radium naturally decays. This means that radium can act as a kind of internal clock for a parcel of water, telling us how fast things happen. Luckily, radium is also extremely rare in seawater, so even though it is a radioactive element it is present at concentrations thousands of times lower than anything we would need to worry about. Even though I use extremely sensitive detectors to measure radium (photo), because it is so rare I still need to sample a very large amount of water to collect enough for a useful measurement– up to 150 litres for just one sample. Radium comes from rocks, and there is plenty of lithogenic (rock) material in the sandy, muddy sediments on the UK continental shelf here off the north west coast of Cornwall. I am using a megacorer to collect pore water (water from in between the sand and mud particles inside marine sediments) and samples from the sediment-water interface, as well as a CTD to measure radium in the water column above. This lets me look at how much radium diffuses out of the sediments and into the sea, as well as how quickly this process occurs. This work is part of the trace metal group (SSB Work package 3), who are ultimately looking at how shelf seas can act as a source of iron, an essential nutrient for marine plant life, that is very scarce in many areas of the ocean. We will be using radium concentrations to help track iron that comes from sediments, where it goes and how fast it gets there.